With Summer drawing towards a close this may not be the ideal time to sell a convertible, but for potential buyers, this might be the perfect time to search for one in preparation for next Summer because negotiating powers on convertibles can get stronger as temperatures get colder. 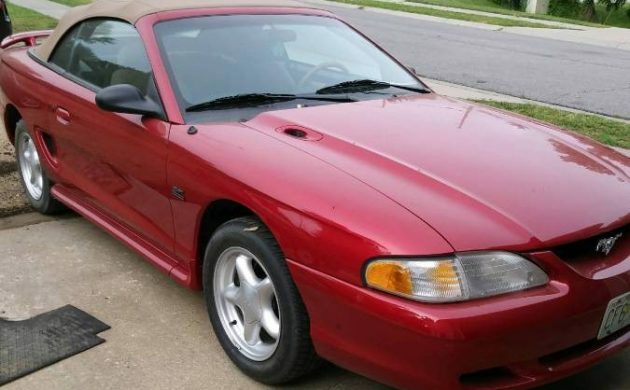 With that in mind, we have this 1995 Ford Mustang GT Convertible which is listed for sale here on Craigslist may be an option to consider. Located in Kansas City, Missouri, it comes with a clean title and a $15,000 asking price. The fourth generation Mustang was released in 1994 and marked the first major redesign of the Mustang since the introduction of the Fox body in 1979, although underneath the car was now based on an updated version of the platform known as Fox-4. The styling was softer than the previous model, and the notch-back and hatchback were no more. This convertible comes from the second year of production and has only traveled a claimed 9,700 miles. I am hoping that the seller has documentary evidence of this, but I must add that for a car that is 23 years old, it does look quite good. The paint looks great and the panels appear to be straight with no obvious issues. I know that this is purely personal preference, but I’m not that sold on the color of the soft-top. To my mind, I feel that it either should be lighter to complement the interior trim, or it should be black. As I said though, personal preference. When a seller makes bold claims about low mileage, this can be fraught with danger. An interior like the one on our feature car can expose a multitude of sins due to the predominantly light-colored trim. Trim of this color can expose dirt, staining or other flaws, and light-colored plastic trim is particularly prone to discoloring. 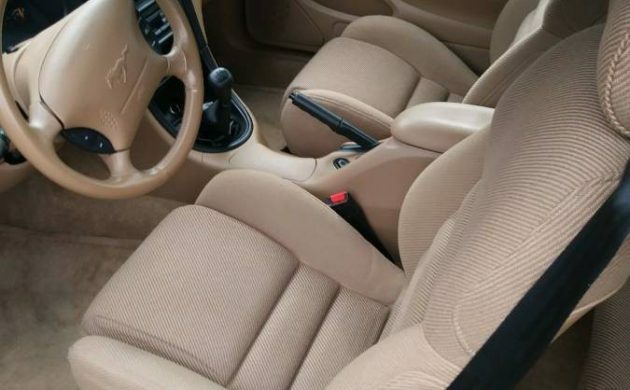 This interior basically provides quite reasonable support for the mileage claim. The seats, carpet and plastic trim all look really good, and this is another car with contoured seats that look really supportive and comfortable. 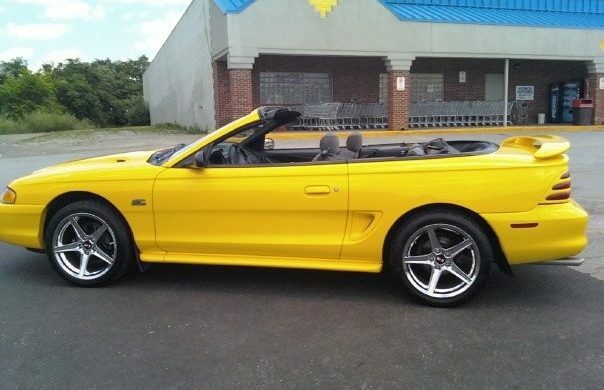 This convertible is the GT version, so under the hood sits the 302ci Windsor V8 engine. In fact, this was the last year that the Windsor was offered before being dropped in favor of the 4.6l engine. The 302 produced 215hp which finds its way to the road in this car via a 5-speed manual transmission. 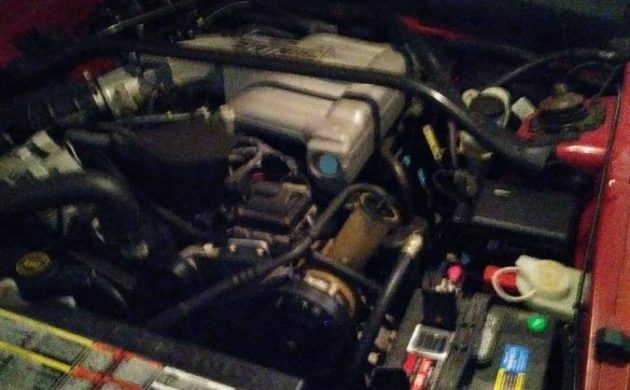 It’s hard to see much under here due to the quality of the photo, but I hope that the seller has a well-documented service history as this will certainly make it a more attractive proposition for any potential buyer. So I guess the big question has to be: Is it worth the asking price? That is entirely dependent on whether the seller has documentary evidence to back their mileage claims and proof of service history. If they have then that puts this at the top end of this model, and that would potentially justify the asking price. 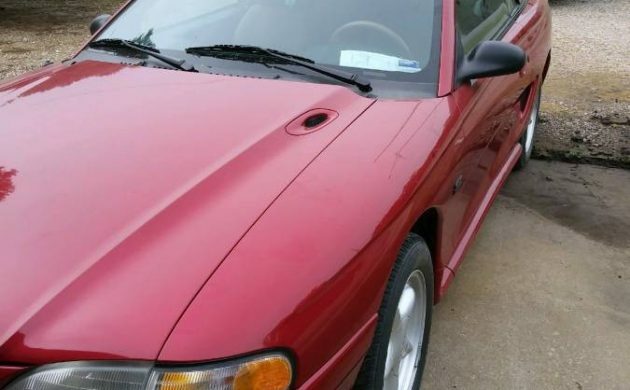 What hurts this is that I’ve had no problem finding 1995 GT Convertibles with higher mileages for up to $9,000 less than the asking price on this one. Having said that, this is probably in the best condition of any that I’ve been able to locate, so in the end, it will all come down to personal preference. One of the few more modern cars I’ve owned,( an ’05 Civic was the newest and please, let’s not go there) was a ’95 Mustang hardtop. 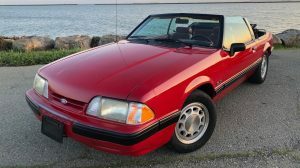 I was familiar with early Mustangs, and just came off owning an ’88 LX 5.0, that I didn’t really care for, yet this was one nice Mustang. 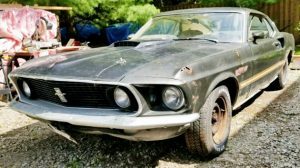 Mine was a V6, 5 speed, and after the 5.0, I wanted the V6. It was everything the ’88 wasn’t. Handled great, better back seat, cruised perfect, left lane car, for sure, comfy seats, pretty good mileage, if I kept my my foot out of it, and truth be known, with the 5 speed, it was as much fun as the ’88. The V6 started using coolant, and I sold it. It was probably one of the nicest cars I had. With a stick, no thanks. I bought the ’94 convertible new with a stick. The car was too jumpy in traffic with the mild cam. It was undrivable and I won’t make that mistake again. The older fox bodied Mustangs had such a hard clutch pedal, there is no joy in driving those. 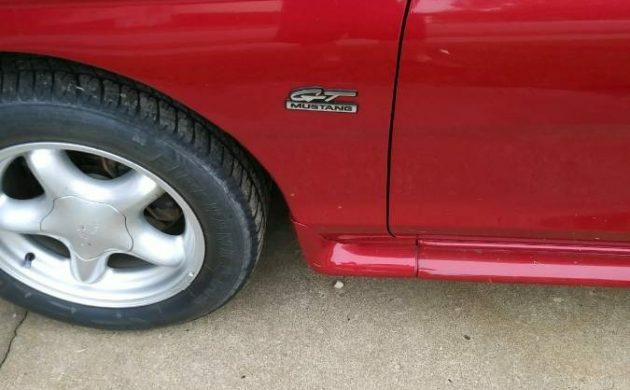 I haven’t driven a ’96 through ‘2004. I did buy a new 2005 with a stick and loved it. I’ve had 2 of these, though I think the 1999-03 New Edge style looks nicer. I love these and you can get nice ones cheaper than this. My only gripe with these, along with other newer convertibles, is that when the top is down, the windshield is sloped back so far that you almost feel like your under it. It takes away some of the “outside” feeling. The ’96 had a different engine. The ’94 and ’95 had a slightly modified 5.0 that was unusable in traffic with the stick. Got a 95 GT Vert in trade for a motorcycle I didn’t ride much anymore. Low miles but was in rough shape. 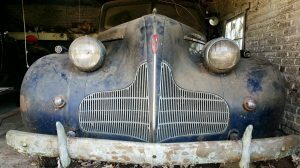 Been doing a junkyard build on it. Handling, performance, repairs and upgrades. 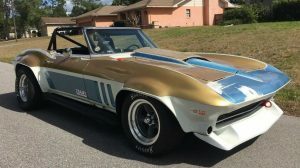 Now has H/C/I swap and Vortech V1 on it and all the other typical goodies. Gathering parts now to do front suspension upgrade. Rear suspension and brakes all around already done. Was never a fan of verts but it is a hoot to take the wife and dog out on back roads and trips to the beach with the top down. 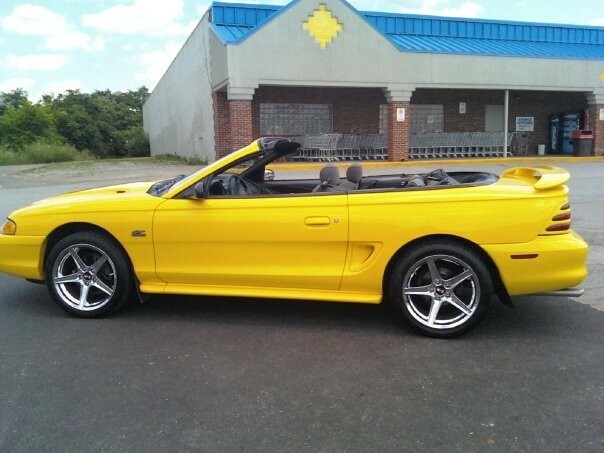 I bought my 94 GT Convertible which I didn’t want for 2 reasons – wasn’t thrilled about the bright yellow, and didn’t want an automatic. I had a built 88 5.0 LX 5 speed at the time, and wasn’t looking for anything else. The 94 only had 36k miles when I bought it, and the price was way right. It has since grown on me and I love driving it. Our 93 Cobra is parked, still. It is teal, gray leather, factory sunroof, long tube headers, borla exhaust, and 373 gears. I think it’s up to a grand total of 17,000 miles. It was a gift from my dear boyfriend’s sister.